The Department of Obstetrics and Gynecology was founded in 1922 by Professor Pranas Mažylis. In the early years after its foundation, the department was located in the Red Cross Hospital . In 1942, it was relocated to the grounds of the newly built university hospital. And then in 1972, it was relocated to a newly built compound especially designed for the needs of the Obstetrics and Gynecology Clinic. Today the Clinic of Obstetrics and Gynecology is the leading center for perinatology and gynecologic surgery. 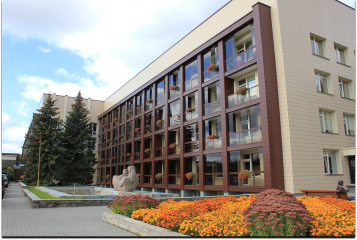 It is a tertiary level referral center accommodating patients from all over Lithuania. The Clinic is composed of an Out Patient Department, Obstetrics Department, Delivery Department and Gynecology Departments. Each department in turn is subdivided into divisions, each specializing in a certain field. The Department of Obstetrics and Gynecology is an important structure in the university hospital being the largest tertiary level referral centre for learning, research and treatment in obstetrics and gynecology in Lithuania. Each year around 350 students from the Lithuanian University of Health Sciences undergo a part of their undergraduate studies in the department. The department also organizes various postgraduate courses for specialists in Obstetrics and Gynecology as a part of CME. It hosts training sessions and courses not only for local doctors, but the clinic is always open for visiting specialists from other countries, especially from Russian speaking countries post Soviet Countries Kazakhstan, Tajikistan, Azerbaidjan. It has become a tradition to invite various renowned authorities in Obstetrics and Gynecology, to give lectures or presentations in our local and international meetings. The Clinic is also the setting of various research projects, with many of its specialists acting as consultants for PhD students. The main areas of research include: high risk pregnancies and deliveries, diagnosing and optimizing treatment modalities of gynecologic and oncogynecologic diseases, in addition novel methods for diagnosing and treating endometriosis. The sector provides examination and treatment for patients with diabetes mellitus, gestational diabetes and other pregnancy complicating diseases (cardiovascular, kidney, thyroid, lungs). All the up to date fetal wellbeing assessment is provided in case of multiple pregnancy and its complications, the maternity and fetal observation and treatment plan is presented in detailed recommendations for the pregnancy and delivery. In the cases of fetal hypotrophy and prolonged pregnancy continuous monitoring is provided (cardiotocogaphy, ultrasound and doplerometry). After diagnosing a twin transfusion syndrome and iniciating a primary examination we organize transfer of pregnant women to other European hospitals for the lasertherapy. In cases of breach presentation an external fetal version is peformed. Women with these pathologies and their newborns are also observed after delivery. Students and residents have possibility to learn prenatal care and treatment peculiarities, to observe fetal wellbeing assessment and it’s interpretation, to visit pregnant women before and after delivery, to participate in visitations, to assist during caesarean section. Resident doctors are trained and supervised by experienced doctors and have the opportunity to perform most of the pregnant women antenatal care tasks and to accomplish fetal wellbeing assessment, also to participate in the treatment process. Patients with hypertensive disorders, Rh incompatibility and isoimmunisation, bleeding during pregnancy, fetal growth restriction, prolonged or multigestational pregnancy, pregnancies with breach presentation are managed in this sector. The majority of the patients here are followed after birth together with their newborns. Students and residents working in this sector have the opportunity to learn the treatment and monitoring plans for high-risk pregnant patients, to assess fetal status by analyzing cardiotocography, ultrasound and doplerometry data of fetus and placenta. Students, residents, postgraduate courses participants not only participate in the pregnancy and fetal pathology examintation, assesement of clinical diagnosis and treatment process, but may also observe and assist during the planned caesarean section operations or other procedures. The sector employs an associate professor and two lecturers, who are supervising the studies of obstetrics and gynecology residents and the family practice residents, clinical skills are acquired by the students studying at LUHS and other universities, as well as clinical practice under exchange programs is performed. Under the leadership of the lecturers of this sector, students and residents carry out research work on preterm labor, preterm rupture of membranes, infection in obstetrics and gynecology and other. women, the fetus or the newborn. process, assist the family and staff. Pre cancer diseases and cancer patients are investigated and treated in Oncogynecology sector using the latest diagnostic techniques and minimally invasive surgical approach. During the studying process at this sector students are acquainted with the diagnosis and treatment of gynecological cancer and premalignant disease (cervical dysplasia, uterine and ovarian neoplasia). Students and fellow doctors have the opportunity not only to actively participate in the process of investigation and treatment of patients and to observe operations, but also to assist experienced professionals during the surgeries. Students have the opportunity to participate in weekly interdisciplinary patient discussions involving pathologists, oncologists, chemotherapists, radiotherapists, diagnostic radiology and other professionals, where not only complex rare and complicated clinical cases are discussed, but also the treatment and monitoring plan is made for each woman with oncological disease. Students, residents, postgraduate and internship doctors also individual participants study and deepen their knowledge at the Oncogynecology sector. Minimally invasive and plastic gynecology sector treats patients suffering from a wide range of gynecological pathology. This sector covers the specific areas of pelvic floor dysfunction treatment, such as prolapse of the genital organs and urinary incontinence. Students have a possibility to see patients with uterine and vaginal prolapse testing and surgical treatment, as well as a range of modern operations for urinary incontinence. A minimally invasive laparoscopic surgery and hysteroscopic operations for a majority of acute and chronic genital diseases are also performed in this sector. Students can observe the endoscopic uterine myoma, polyps, ovarian cysts, ectopic pregnancy and other diagnostic and therapeutic operations beeing perfermed. Women's reproductive health sector focuses on the management of the menstrual cycle disorders and abnormal uterine bleeding through adolescence to premenopausal age, manages fertility disorders and complications occuring after assisted reproductive technology procedures, concentrates on early pregnancy pathology cases (such as ectopic pregnancy, bunted ovum, spontaneous abortion, trophoblastic disease). There are facilities to acquire diagnosis and differential diagnosis skills of the above mentioned pathologies, aslo to learn the diagnostical and treatment interventions and methodologies of endoscopic (hysteroscopy, laparoscopy) operations. Septic Gynecology sector is engaged in the treatment of patients with pelvic inflammatory disease, gynecological origin of peritonitis and sepsis, postpartum infectious complications. LUHS KC Woman consultation provides tertial level specialized counseling services in the fields of oncogynecology, high-risk pregnancies, infertility, endocrine and urogynecology. Antenatal genetic counseling and immediate emergency assistance is also provided. During the year, 44 doctors consult about 30,000 patients and perform about 1,800 outpatient surgeries. The family medicine, dermatovenereology specialty residents and specialty skills appraising doctors are also learning here and acquiring practical skills in obstetrics and gynecology. Students collect material from the outpatient case histories for their students scientific paper presentations.